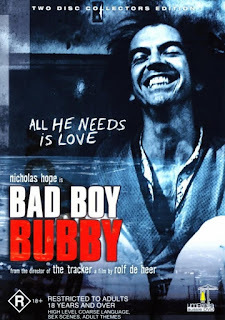 Tag line: "All he needs is love"
Bad Boy Bubby is some sort of bizarre masterpiece. Directed by Rolf de Heer, this 1993 film tells the story of Bubby (Nicholas Hope), a guy who, despite being in his mid-‘30s, has never once left the small apartment he shares with his abusive mother, who’s played by Claire Benito (in order to keep Bubby from leaving, his mom tells him the air is poison, and puts a gas mask on whenever she ventures outside to convince him the threat is real). Spending his days playing with his pet cat and his nights satisfying his mother’s lustful needs, Bubby seems content. This all changes, however, when his estranged father (Ralph Cotterill) re-enters the picture. All at once, Bubby is pushed to the side, and when a seemingly innocent act ends in tragedy, he leaves the apartment for the first time ever. Though he has difficulty adjusting to the ways of the world, a chance meeting with both a neighborhood garage band and a social worker he lovingly calls Angel (Carmel Johnson) allows Bubby to finally experience the freedom that had been kept from him for so many years. Bad Boy Bubby is, in many ways, an experimental film. For one, all sound was recorded using two small mics hidden behind Nicholas Hope’s ears, thus allowing the audience to hear the world exactly as the movie’s lead character hears it. In addition, de Heer utilized the talents of over 30 cinematographers, the majority of whom shot only a single sequence. As a result, the style is very different from scene to scene (supposedly, each cinematographer had full creative control, and wasn’t permitted to view footage shot by anyone else), giving the film a somewhat frenzied look. Its unique technical aspects aside, Bad Boy Bubby also benefits from Nicholas Hope’s portrayal of an innocent thrust into a world he cannot possibly understand. With no idea how to communicate with those around him, he simply repeats whatever he hears, and while most of the comedy stems from Bubby’s interactions with others (the scene where he walks into a donut shop and orders exactly what the woman before him ordered, copying her voice and inflection as he does so, made me laugh out loud), it also leads to some uncomfortable moments (because he doesn’t know what he’s saying, Bubby is often crude and profane). Yet, despite the occasional hiccup, Bubby continues to view the world as if he were a child, gazing in wonder at anything and everything. In fact, his simplicity is so endearing that it attracts the attention of “Angel”, the caretaker who eventually falls in love with him. That said, Bad Boy Bubby is, at times, quite alarming; aside from his incestuous relationship with his mother, Bubby inadvertently kills his pet cat when he wraps it in plastic (not wanting to leave it behind, he packs its dead carcass in his suitcase and carries it with him wherever he goes). But even in its most shocking scenes, the film exudes a charm that’s hard to ignore. Filled with humor and pathos, Bad Boy Bubby is a unique motion picture experience that you won’t want to miss.